Like the individual organism, the population is a real and functional unit in biology. Defined as groups of organisms that are genetically and spatially distinct from other such groups, the population is the fundamental unit of evolution. Populations are dynamic, they grow, decline, colonize new populations, and go extinct. 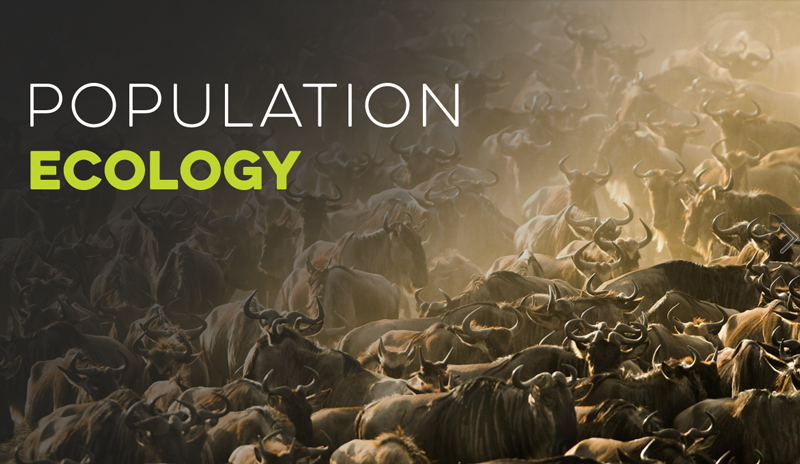 Understanding how and why populations change over time is critical to such wide-ranging practical issues as pest control, endangered species protection, and even human population growth. 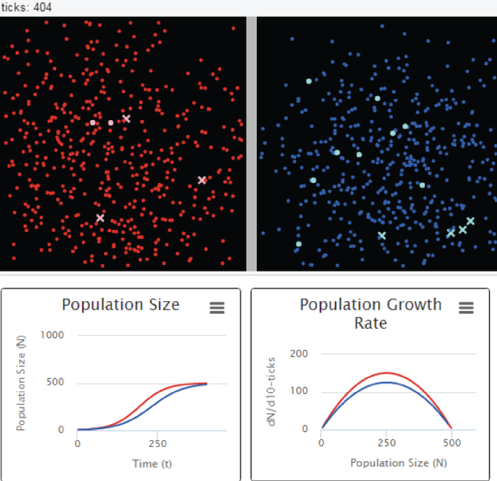 In this section there are models exploring population growth and how to estimate population sizes. Models are best viewed on large screens and landscape modes. This model illustrates resource-limited population growth. Populations have a per-capita growth rate and carrying capacity. Two populations are compared on three graphs: N vs time, dN/dt vs N, and dN/Ndt vs N. Individuals in the populations are viewed in windows, illustrating that even at carrying capacity, there are still births and deaths in the population. ⇒Links to older versions of each model are found here. Share this model with others. The number of individuals in a population, or population size, is perhaps the most important thing to know about a population. 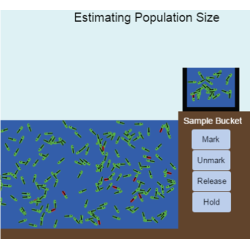 This model is an in-depth exploration of the mark-recapture method of estimating population size by simulation of a meadow vole population. The individuals can be trapped, marked, released, and re-trapped. This advanced model assumes familiarity with the Lincoln-Peterson estimate of population size. 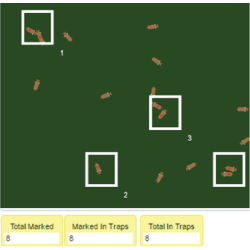 It is designed to be used in exploring how factors such as population distribution, trap experience (learning to avoid or seek out traps), population size, and sampling effort can affect the precision and accuracy of the estimate.